In the much awaited press event yesterday (11th Oct) Microsoft launched 10 brand new handsets based on its Windows Phone 7 operating system. The handset manufacturers include Samsung, LG, HTC and Dell. The devices will be available in 30 countries through more than 60 service providers. The phones will first arrive for sales in Europe and Asia on 21st October and then on 8th November in the US. This might be an intentional move from Microsoft to tap in to the huge Asian markets like China and build a user base in the continent where the largest portion of the world’s population lives. The phones are called Samsung Focus, LG Optimus, Samsung Omnia, HTC Surround, LG Quantum, Dell Venue Pro, HTC HD7, HTC 7 Trophy, HTC 7 Mozart and LG Optimus 7Q. The sets will be available through AT&T, Deutsche Telekom AG, O2 and Orange in the US. Microsoft’s approach is ambitious and confident as launching not 1 or 2 but 10 sets at a time takes courage and a smart business plan in place. 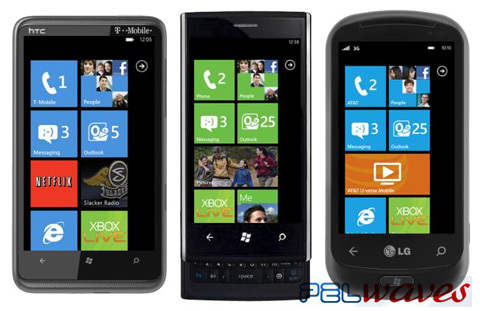 MS were in preparations to develop and launch the Windows Phone 7 for quite a while and now that the phones are ready to start shipping soon, they will have to go through the usual expected comparisons with the big players in the market.